Give your melodica a bath! Homepage › Forums › Melodica construction, repair and maintenance › Give your melodica a bath! This topic contains 14 replies, has 5 voices, and was last updated by Francis Valerio 6 months, 3 weeks ago. 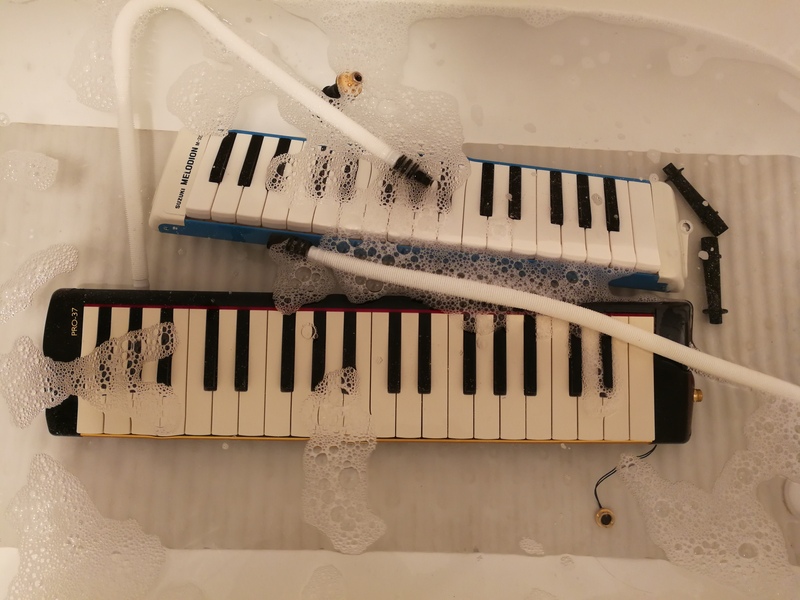 We have discussed flushing melodicas with water, submerging melodicas in water or in water/vinegar or other solutions, even running one through the dishwasher. But here is as easy refresher for almost any melodica or keyboard harmonica that does not have wooden parts. Simply submerge your melodica in warm water, working the keys and spit button to get all air out, and leave it there for 4-5 hours, shaking it around occasionally and then again before you take it out. After you take it out, work all keys and the spit valve until quite a bit of water has been exprelled and the notes are all or almost all sounding at least roughly. Swing the melodica around a few times for good measure, and then stand it on end overnight. Chances are that you will see some particles or debris when you are done at the sink. Chances are that after playing any remaining moisture out in the morning, you will find that the keys work more freely. If there was an odor problem, it will be gone or at least diminished. This is especially effective with an older vintage instrument with sticking keys, but it can also make a noticeable difference with a heavily used relatively new melodica. There’s more to do about odors or persistently sticky keys, but a good Saturday night bath can work wonders. Older vintage melodicas for which this cannot be recommended would include the Hohner Professional 36, the Hohner Piano 36, Claviettas and other 1960s-70s Italian models, the Bohema I’m sure, and in general very old melodicas whose gaskets may be in the process of decomposition. Melodicas are designed to handle moisture, but failing gaskets are vulnerable to it, more or less depending on the material. TQ, and so happy to be part of your community. Will upload something soon. The 44H arrived last week!!! I’m not sure about the output jack, but usually it is older melodicas, especially vintage models that need a bath. Your ten year old Pro 37 could possibly benefit from one if keys are sticky, for example, but it’s not likely that the Hammond would need it in the foreseeable future. Hi Alan. Yes, the question is a bit premature fur the Hammond 😊. I just wanted to know. I’ll give the Suzuki a wash, and I also have a Yamaha 32 key, the light blue one, which is a few years older. That was my first. Bathtime for them both then. TQ again. Joanna. Hi MM! Thank you for the advice. Yes I had a vague idea that might be the case, but wanted it confirmed by a pro. And you did! I won’t need to clean the 44H for a while, but will get the screwdriver out when it needs. “[Musicians] need to be aware that there are risks that instruments can become colonised with mould and fungi and this can be related to serious and potentially fatal lung disease,” said Dr Jenny King, first author of the study, of North Manchester general hospital. Hi Daren. Pouring in liquid sounds a bit scary! Maybe I’ll just have to learn how to do it. I read that post about the danger of fungi and mould, and the importance of hygiene. Does anyone open up their Hammond 44H, to clean the relevant parts while keeping the electric bits dry? First bath! After 10 and 12 years. There is moisture on and around the reeds after playing, especially after extended playing, but I’m curious about why you feel the need to clean it or dry the reeds off after playing, Francis. This is normal with a melodica. The moisture is from condensation and does not soil the inside of the instrument. Occasionally there’s reason to take a melodica apart and/or give it a bath. But I don’t think it’s a good idea to be taking the melodica apart frequently (especially an expensive one such as the Hammond) or to be running water through it on a regular basis. When you open it after playing, there’s a temptation to wipe off the reeds, but I don’t think there’s any reason to do so unless you’re tuning it. My opinion; others may disagree. Some time later, I bought a Superforce 37 Hohner, but this time I always opened it after playing. To this day it works like the first day. This is the reason, I understand that for some it is strange, but it works for me. Hey, Francis, do what works for you. But I don’t think reeds of the Hammond will rust. Or of a Yamaha or high end Suzuki. Not sure about the recent Hohners. These models all have phosphor bronze reeds.